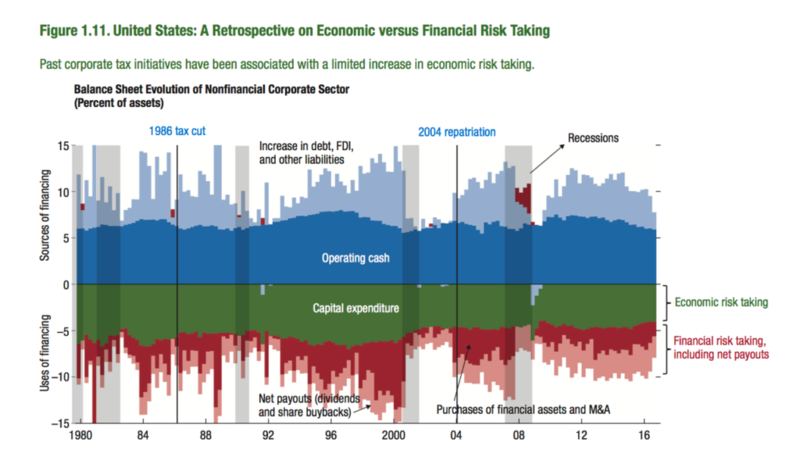 For some time now, TLR has been pointing to risks in rising nonfinancial corporate debt levels – a sharp contrast with the deleveraging that has been going on in the household and financial sectors. In its latest Global Financial Stability Report, out this morning, the IMF confirms our worries, offering considerable detail on the nature and risks of increasing corporate leverage. • Even with a cut in corporate tax rates, many firms would be too cash-constrained to increase capital spending – which is the economic rationale for such a policy change. Three sectors in particular – energy, utilities, and real estate – which together have contributed almost half the capital spending among S&P 500 firms in recent years, would find it difficult to boost investment. “Perhaps more important,” writes the IMF, “cash flow from tax reforms may accrue mainly to sectors that have engaged in substantial financial risk taking,” like purchases of financial assets, M&A, and dividends/buybacks. Such spending, the Fund notes, has accounted for more than half of free corporate cash flow since 2012 (another risky practice we’ve been highlighting in our quarterly reviews of the Fed’s financial accounts). • Despite high equity valuations, firms have chosen to buy their own stock rather than floating fresh shares, and have often been using debt to finance the buybacks. • Corporate credit quality, as measured by weakening covenants and rating downgrades, has been deteriorating – and not just in the energy sector. Capital goods and health care are looking dodgier as well. • Leverage ratios are rising as credit quality deteriorates. (See graph below. All graphs from the IMF report.) 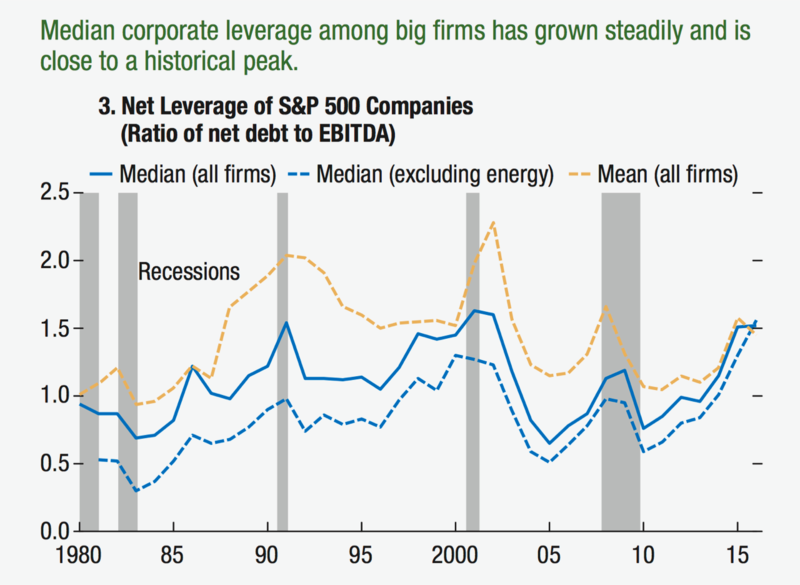 Median debt of S&P 500 companies is close to a historic high of over 1.5 times earnings – and it’s not just energy. A broader universe of 4,000 companies, accounting for about half of all U.S. corporate assets, is approaching levels last seen just before the global financial crisis. • Despite low interest rates, debt service ratios have fallen dramatically, as shown on graph below. 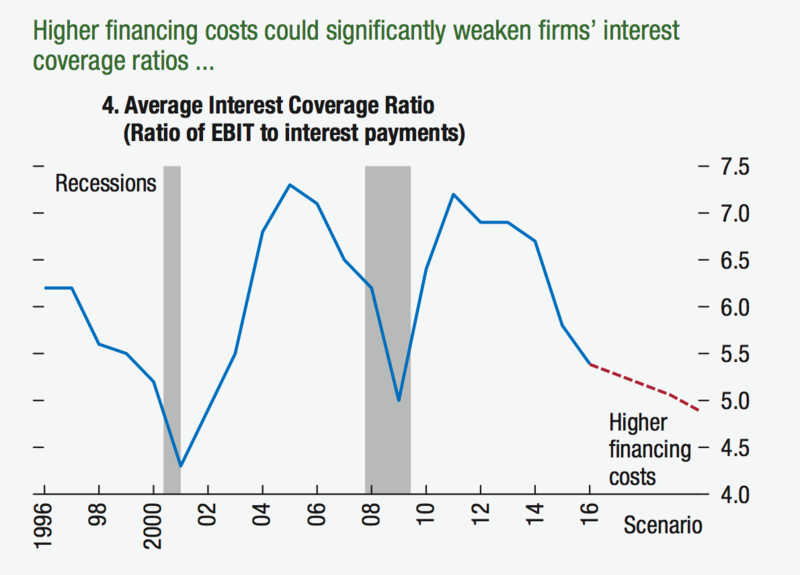 Interest coverage is less than six times earnings, a ratio below what we saw before the financial crisis, and on a par with what we saw in 1999, just before the dot.com bust. Should tax cuts lead to wider budget deficits (which are not terribly high right now) and higher interest rates, interest coverage ratios could decline further. • You might think that a cut in corporate taxes and moves that would allow the repatriation of funds stashed in tax havens abroad might ease the situation, but the IMF warns against those comforting thoughts. As shown on the final graph, the 1986 corporate tax cut and the 2004 repatriation led not to a reduction in debt or an increase in capital spending, but an increase in financial adventuring. Were such measures accompanied by a weakening of financial regulation and oversight, things could get very bumpy.